Cats have two thyroid glands, which are located in the neck and play a vital role in regulating the body's metabolic rate. Hyperthyroidism is characterized by the overproduction of thyroid hormone and a subsequent increase in metabolic rate. This disease is common in older cats. Although the thyroid gland enlarges in hyperthyroidism, it is usually a benign or non- malignant change. Fewer than 2% of hyperthyroid cases in cats involve malignant thyroid gland tumors. Many organs are affected by hyperthyroidism, especially the heart. Older cats are at greater risk for developing hyperthyroidism. Environmental risk factors have been investigated and may predispose some cats to hyperthyroidism, although the specific mechanisms are not known. Exposure to high levels of dietary iodine may cause susceptible cats to develop hyperthyroidism. No individual breed is known to have a greater risk, although Siamese, Burmese, Persian, Abyssinian, and Himalayan breeds appear to have a somewhat decreased incidence of hyperthyroidism compared to other breeds. The typical cat with hyperthyroidism is middle aged or older; the average age of affected cats is approximately 12 years. Only about 5% of hyperthyroid cats are younger than 10 years of age. The most common clinical sign of hyperthyroidism is weight loss due to the increased rate of metabolism despite an increased appetite. Affected cats are often restless, and may become cranky or aggressive. They may have increased water consumption and urination. It is also common for hyperthyroid cats to exhibit increased vocalizing, particularly at night. They may develop periodic vomiting or diarrhea, and fur may appear unkempt. In some cats, anorexia develops as the disease progresses. Two secondary complications of hyperthyroidism can be significant; hypertension (high blood pressure) and a particular form of heart disease called thyrotoxic cardiomyopathy. Hypertension develops due to the increased pumping pressure and elevated heart rate that occurs with thyrotoxic cardiomyopathy. About 25% of cats with hyperthyroidism become hypertensive. In some cats, blood pressure can become so high that retinal bleeding or retinal detachment will occur, resulting in sudden blindness. "Both cardiomyopathy and hypertension are potentially reversible with appropriate treatment of the disease." Thyrotoxic cardiomyopathy may develop because the heart enlarges and thickens to meet the increased metabolic demands. In some cases, the cat will develop a heart murmur associated with the cardiomyopathy. Both cardiomyopathy and hypertension are potentially reversible with appropriate treatment of the disease. However, unless the retinal detachment is treated immediately, permanent blindness can occur. The exact cause of hyperthyroidism has not been identified, although the role of dietary iodine continues to be investigated as an influencing factor in susceptible cats. Diagnosis of feline hyperthyroidism is generally straightforward (see handout "Thyroid Hormone Testing in Cats"). The first step is to determine the blood level of one of the thyroid hormones, called total thyroxine (TT4). Usually, the TT4 level is so high that there is no question as to the diagnosis. Occasionally, a cat that is suspected of having hyperthyroidism has a TT4 level within the upper range of normal. When this occurs, a second test, usually either a free T4 by equilibrium dialysis (FT4 by ED) or a T3 suppression test is performed. If these tests are not diagnostic, a thyroid scan (thyroid scintigraphy) can be performed at a veterinary referral center, or the TT4 can be measured again in a few weeks. Since fewer than 2% of cats with hyperthyroidism have cancerous growths of the thyroid gland, treatment is usually very successful. Before choosing any form of treatment, several tests are performed which may include additional blood tests, a urinalysis, chest X-rays, an ECG, and blood pressure measurement. These tests are needed to evaluate the overall health of your cat and to predict the likelihood of complications with the chosen treatment protocol. Ultrasound of the heart (called echocardiography) may be recommended based on your cat's condition, especially if there is any concern about cardiomyopathy. Thyroid scintigraphy may also be recommended to confirm a diagnosis and determine the size of the organ prior to surgery or radioactive iodine. "There are several treatment options; your veterinarian will determine the best choice for your cat." Surgery. Surgical removal of the affected thyroid gland(s) may be very effective. Since hyperthyroid cats are usually over eight years of age, there is a degree of risk involved. However, if your cat is otherwise healthy and the initial diagnostic tests and treatment did not reveal any underlying conditions, the risk is minimal. If the disease involves both lobes of the thyroid gland, two surgeries may be required, depending on the surgeon's choice of procedures. In many cats, only one thyroid lobe is abnormal, so only one surgery is needed. "Surgical removal of the affected thyroid gland(s) may be very effective." 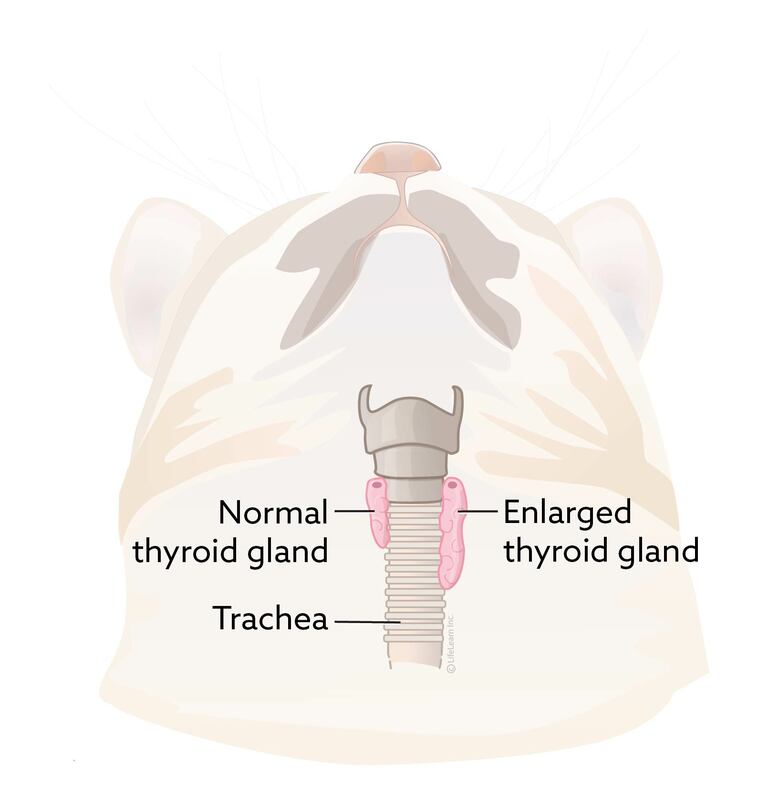 Some hyperthyroid cats have thyroid cells in abnormal locations called ectopic thyroid tissue (thyroid tissue located under the tongue, further down the neck, or all the way to the base of the heart)- and they may remain hyperthyroid after surgery. It is best to perform a nuclear scan before surgery to rule out ectopic thyroid tissue. If surgery is the chosen treatment method, the anti-thyroid medication methimazole (brand names: Tapazole® or Felimazole®) may be prescribed for several weeks prior to the operation. During that time, the ravenous appetite should subside, your cat will probably gain weight, and her blood pressure and heart rate should normalize. Methimazole is also given ahead of surgery to determine if the cat has a secondary medical condition such as kidney or liver disease that has been masked by hyperthyroidism. If your cat successfully undergoes the initial treatment without complication, surgery will be performed. Your cat may be hospitalized for one to two nights following surgery, and should begin to eat and behave normally after returning home. One to two weeks after surgery, another TT4 level is measured. Oral medication. Lifelong administration of methimazole can control the effects of an overactive thyroid gland. It takes several weeks for methimazole to restore thyroid hormone levels to normal. Some cats develop side effects to methimazole, which may include vomiting, lethargy, anorexia, fever, liver damage, anemia, and a decrease of white blood cells in the blood. In some cases, a decrease in blood platelets (thrombocytopenia) may also occur. 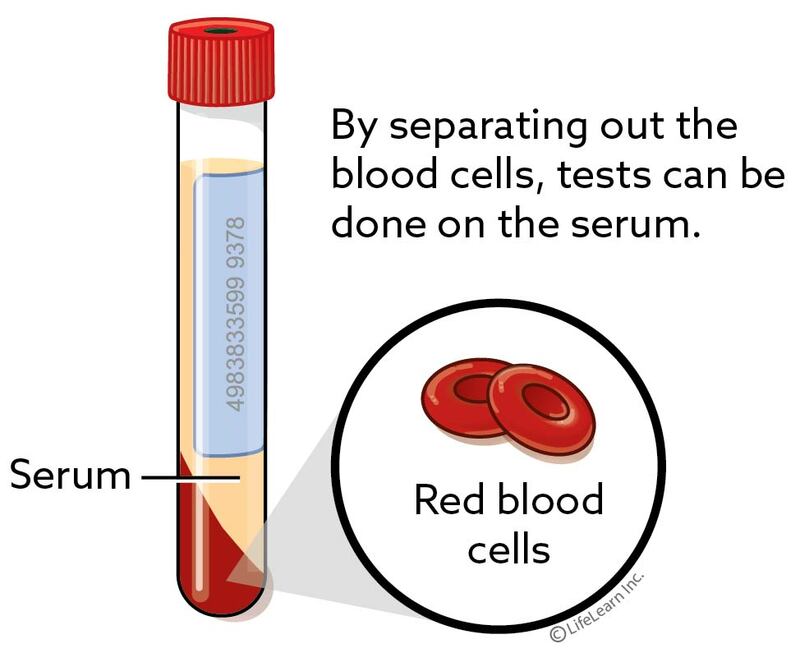 Since platelets are important for the clotting of blood, thrombocytopenia may lead to problems with excessive bleeding. Because of these rare but serious side effect risks, your cat will need to be closely monitored by having simple blood tests performed every three to six months when using this medication. Methimazole blocks the production of excess thyroid hormone rather than destroying the abnormal thyroid tissue, so the medication must be given for the remainder of the cat's life. This type of treatment is appropriate for a cat that is a poor surgical risk due to other health problems or is exceptionally old. As stated above, it may also be used for a few weeks to stabilize the cat that is at increased surgical risk because of cardiac complications. The required dose of methimazole can change over time so monitoring thyroid levels in treated animals is recommended every 3-6 months once their condition is stable. Radioactive iodine. A very effective way to treat hyperthyroidism is with radioactive iodine therapy (I-131). When an injection of radioactive iodine is given, it destroys the abnormal thyroid tissue without endangering other organs. I-131 therapy does not require anesthesia, and it eliminates the need for daily medication. Treatment usually requires one or two weeks of hospitalization at a veterinary hospital licensed to administer radiation therapy. For the same reasons as surgical treatment, your cat will likely be started on methimazole for about a month prior to radioactive iodine therapy. Prescription nutrition. Feeding an iodine limited diet (Hills Prescription Diet y/d®), can result in resolution of clinical signs and a lower thyroid hormone concentration. The food is not medicated. Over 10 years of clinical nutrition research revealed that by controlling dietary levels of iodine, the hyperthyroid cat's body would resume normal thyroid hormone production. This is not an iodine-free diet, but rather a diet with a precisely controlled iodine content of 0.2ppm - a very small amount. For this prescription diet to work, it must be the only food fed, and this means no cheating with treats. Because each cat is different, your veterinarian will advise you on the best treatment for your individual cat. What may work for one cat may not work for another. Other Therapeutic Monitoring. Due to the damaging effects of hyperthyroid-induced hypertension on your cat’s kidneys, it is important that blood kidney values be reassessed once their thyroxine level has normalized, even if they were normal on initial blood tests. Often treating hyperthyroidism will unmask hidden kidney failure that will require additional care and is best detected early in the course of the disease. Will my cat be cured with treatment? Recurrence of the disease is a possibility in some cats. Recurrence of hyperthyroidism is rare after I-131 therapy. Surgical patients may become hyperthyroid again if abnormal cells were missed at surgery or if new abnormal cells develop. If methimazole dosing is discontinued, hyperthyroidism will return. Cats exclusively fed the prescription diet will remain normal, but if the diet is discontinued, they will once again become hyperthyroid. Many owners of cats with hyperthyroidism are hesitant to have radiation therapy or surgery because of their cat's advanced age. It is important to remember that old age is not a disease. therapies are usually excellent, and most cats have a very good chance of returning to a normal state of health." The outcomes following most hyperthyroid therapies are usually excellent, and most cats have a very good chance of returning to a normal state of health. Cats managed with diet or medication generally do well as long as their feeding is consistent or their medication is administered routinely and follow-up blood and diagnostic tests are performed as scheduled. There are currently no known preventive measures for hyperthyroidism, but early diagnosis decreases the secondary problems and improves the prognosis. All middle-aged and senior cats should receive a complete physical examination by a veterinarian every six months. Special attention should be given to the thyroid glands, looking for evidence of enlargement and the clinical signs of hyperthyroidism. Annual blood and urine tests are important in all cats over age six to detect hyperthyroidism before potentially irreversible damage occurs.